And there it is. The New England Patriots collected the Stones of Sunlight, the Staff of Rain, and the Token of Erdrick. Tom Brady will promptly whisk Princess Gwaelin away to a bed and breakfast somewhere south of Cantlin. Meanwhile, Bill Belichick will now reproduce a set of Erdrick weapons and armor for the entire roster, and the Patriots will finish 16-0. Peyton Manning, having been vanquished, loses half his gold. 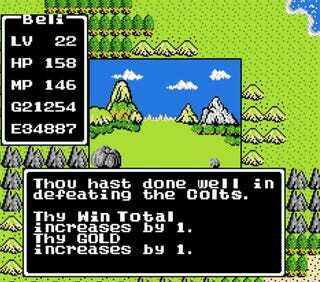 But unfortunately the Colts cannot hit the Reset button. Their season progress has already been recorded in the Imperial Scrolls of Honor. On an actual football comment, I can't remember the last time I saw so many pass interference calls in a game. CBS sideline reporters were actually flagged 15 yards for obstructing Belichick on his way to the locker room.